This past Sunday was an epic day-trip around Osceola County, with hopes to find Burrowing Owls, Red-headed and Red-cockaded Woodpeckers, maybe some Whooping Cranes, and anything else that might cross our paths. 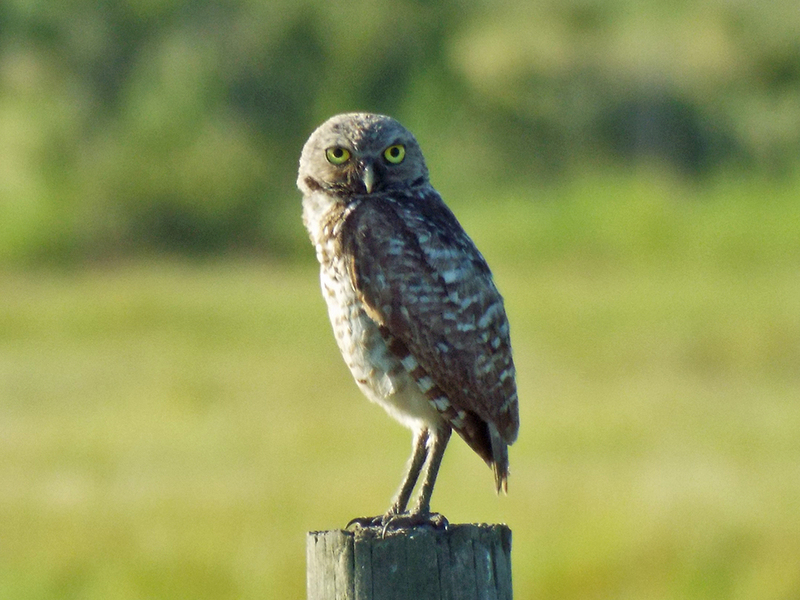 Our first stop was to find some Burrowing Owls along Deer Park Road, west of the St. Johns River. 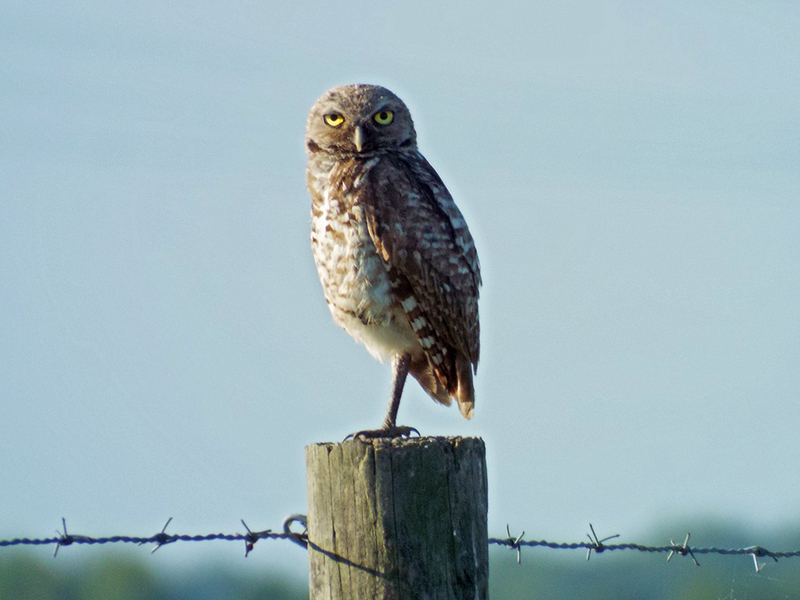 While there are clear hotspots with some very personable owls out toward the Gulf Coast, the possibility of this species within about 30 minutes of home was too good to ignore. Most of the area near Nova Road and Deer Park road is a cattle ranch, and on the left or northbound side of the road there were indeed many head of cattle with tall grassy vegetation. On the right side, though, the fields were cropped very short and there were no cows. There were, however, quite a few Sandhill Cranes. I counted just about 40 adult sized birds, in pairs and larger groups, spread throughout one field. 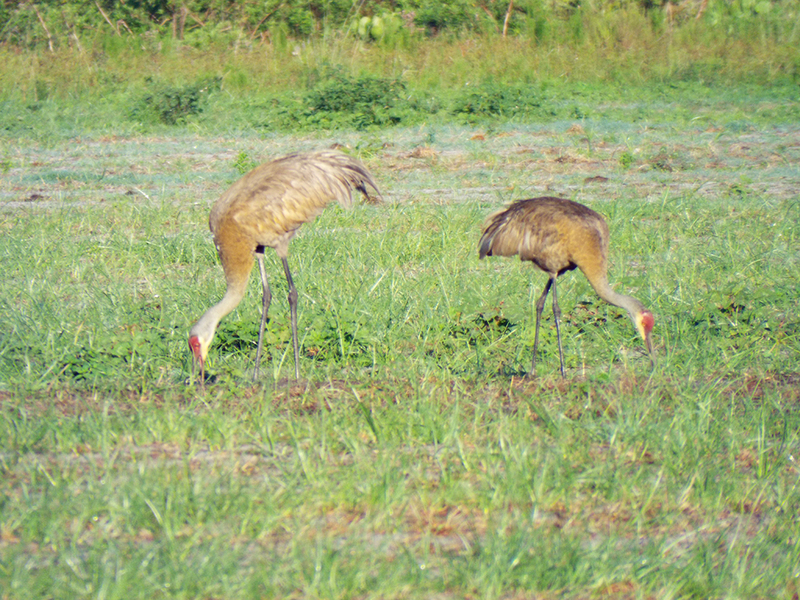 The cranes feeding at this location had a rusty wash in their feathers, something the cranes closer to home in Brevard County seem to lack. 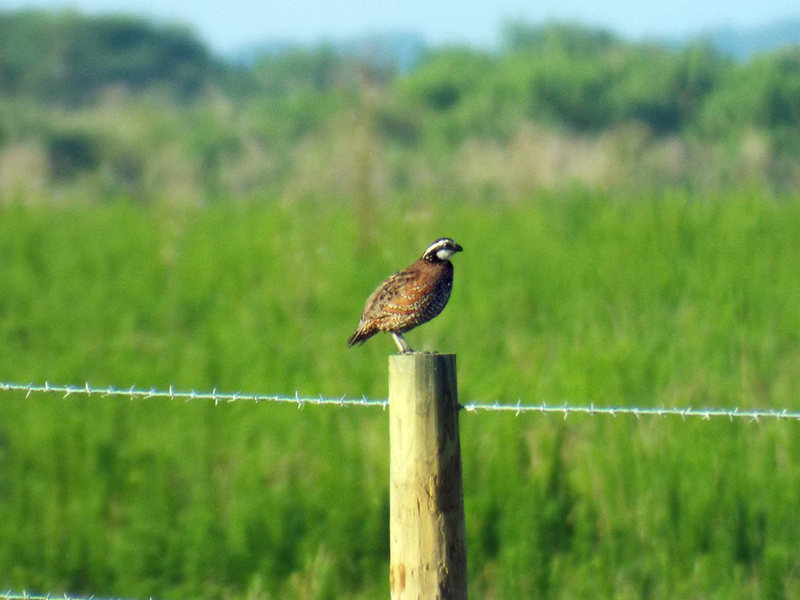 There were also Eastern Meadowlarks, some Northern Mockingbirds, and even a Northern Bobwhite. Unlike the bobwhites I’ve encountered at both the Cruickshank Sanctuary and Joe Overstreet Road, this bird was not very shy and was flying and running around in the open. We parked not far from the Nova Road intersection and walked south, keeping an eye on the fence line. After about a thousand feet there was a small, bullet shaped bird on a fence post. We cautiously moved closer until we got a decent look in binoculars and saw it was a Burrowing Owl (and just about where we saw the first marker on eBird). After going back to bring the vehicle closer, we moved in to get some better photographs. We noticed another owl on a post nearby, and then another further down the road. One eventually flew into the grass near the first owl, but the others stayed on the posts and watched us closely, not the least perturbed. The lighting was really tough, I took as many photos as I could, hoping at least a handful would be useful to me. After a while we didn’t want to overstay our welcome to their roadside perches and moved on. This was a life bird for both me and Camille, so we were really pumped and hoped it would set the tone for the rest of the day. Our next stop was to revisit Brinson Park in Kissimmee, hopeful to see the Fulvous Whistling Ducks that are continuing to be reported on eBird. 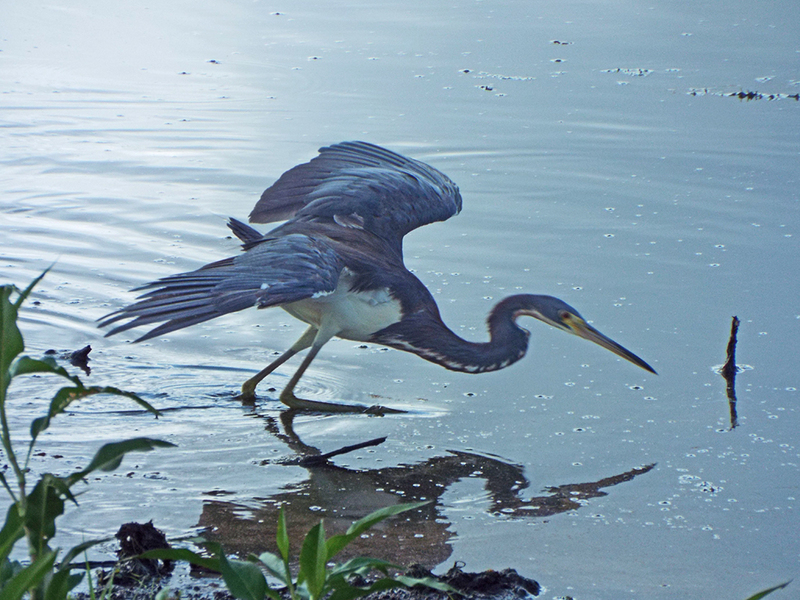 The same mix of birds from the last time was present: Roseate Spoonbills, Limpkins, White and Glossy Ibises, lots of Boat-tailed Grackles and Red-winged Blackbirds, a Black-necked Stilt and an assemblage of herons and egrets. 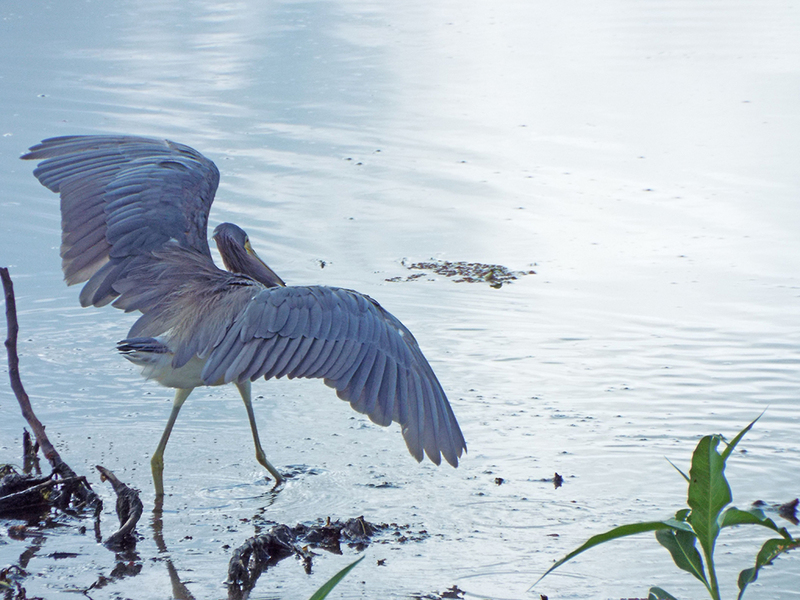 One of the Tricolored Herons was doing a Reddish Egret impression, lurching and spinning around near the shoreline. 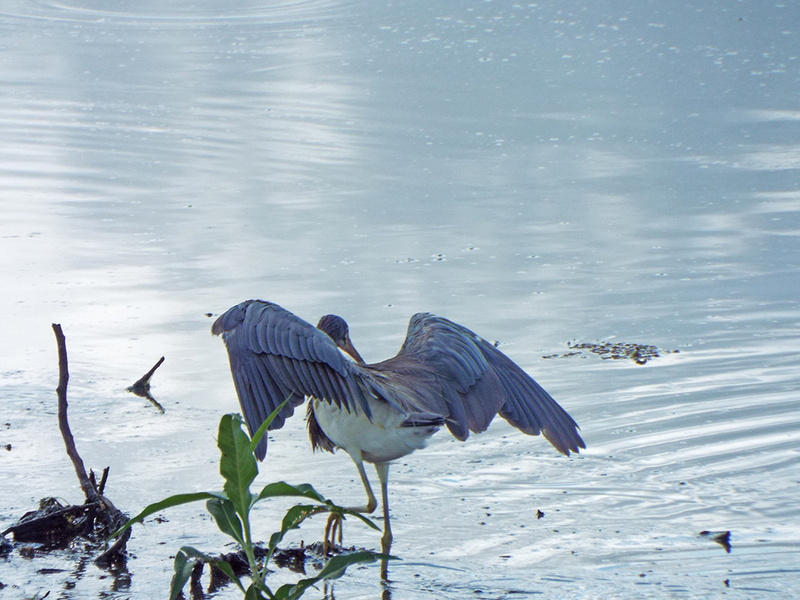 I’ve never observed any other heron hunt this way (Snowy Egrets will sometimes lunge or shuffle at prey, but never in the “drunken” manner of a Reddish Egret). We walked along the shoreline, scanning the vegetation for Fulvous Whistling Ducks, but there were none to be seen. A couple from Scotland were photographing birds, so I asked if they had any idea where the ducks might be, but they didn’t know. After a lovely conversation with them, we crossed the road over to the marshy area north of the lake. There were more Black-necked Stilts, spoonbills, and herons. Some ducks just past the edge of my binocular’s reach looked promising, but the distance and lighting made it impossible to know for certain that they were not Black-bellied instead of Fulvous. 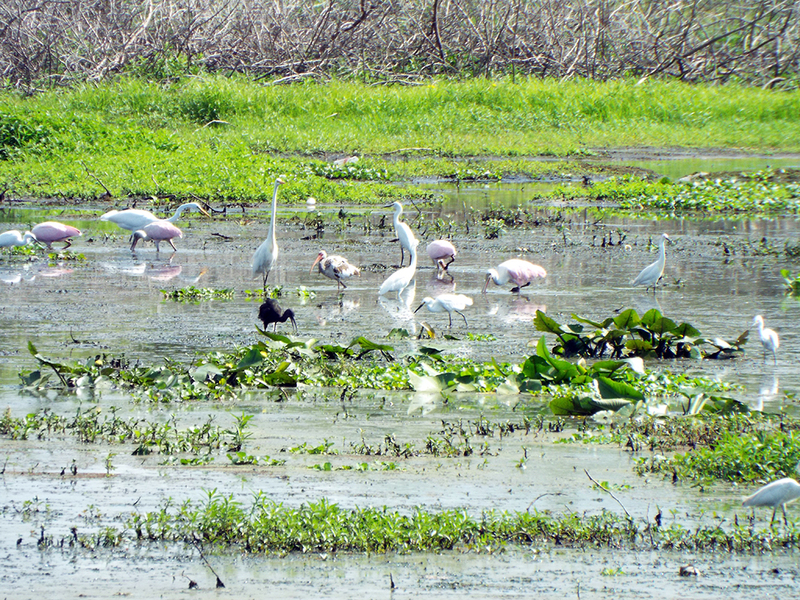 A motley crew of egrets, spoonbills and ibises across from Brinson Park and Lake Tohopekaliga. Continuing the tour of central Florida, we headed to Joe Overstreet Road, hopeful for possible Burrowing Owls, Red-headed Woodpeckers, and perhaps even Whooping Cranes (at the nearby Double C Bar Ranch). We struck out on all accounts there, but we did see more Eastern Meadowlarks and some American and Fish crows. 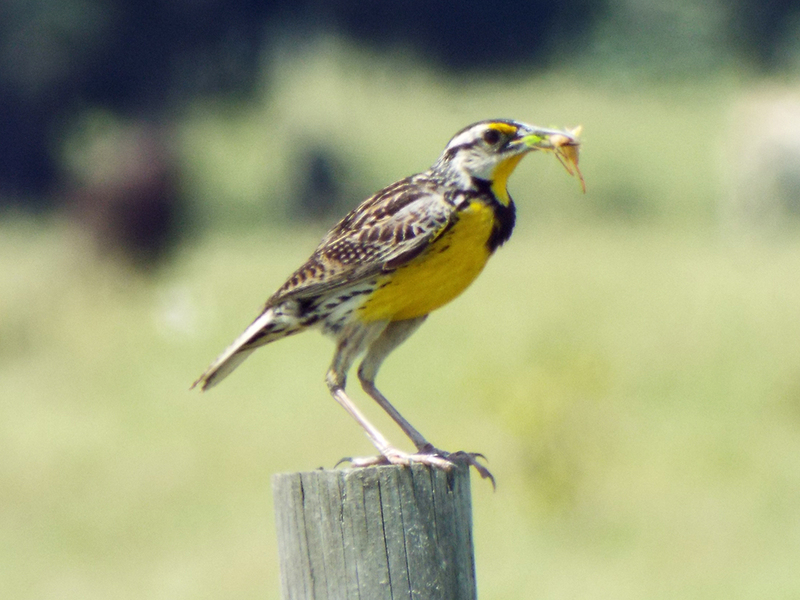 With two insects stuffed into its beak, it’s possible this meadowlark was just extremely hungry. It’s more likely that there are young mouths to feed. At Joe Overstreet Landing it was fairly quiet, though we did see two Bald Eagles and a few herons and egrets, widely scattered around the lake’s edge. The heat of the day was already building, but we were still hopeful to catch some Red-headed Woodpeckers or even an outside chance for Red-cockaded Woodpeckers at the Three Lakes Wildlife Management Area. Three Lakes is one of a few areas in Florida with Red-cockaded Woodpeckers. Just a couple of decades ago, this species’ future was bleak. 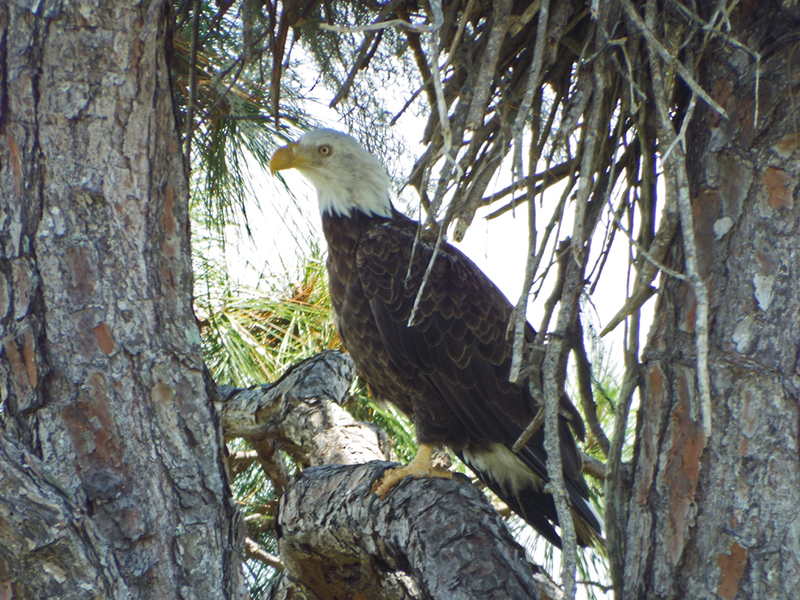 The birds require a very specific pine flatwoods habitat with large, older trees they can nest in. Unfortunately, naturally occurring nest trees had been cut down for lumber and development, so the birds had no where to breed. When we discussed Red-cockaded Woodpeckers in an Environmental Geography class in college, some predictions had the birds extinct by the end of the 1990s. Then something extraordinary happened. 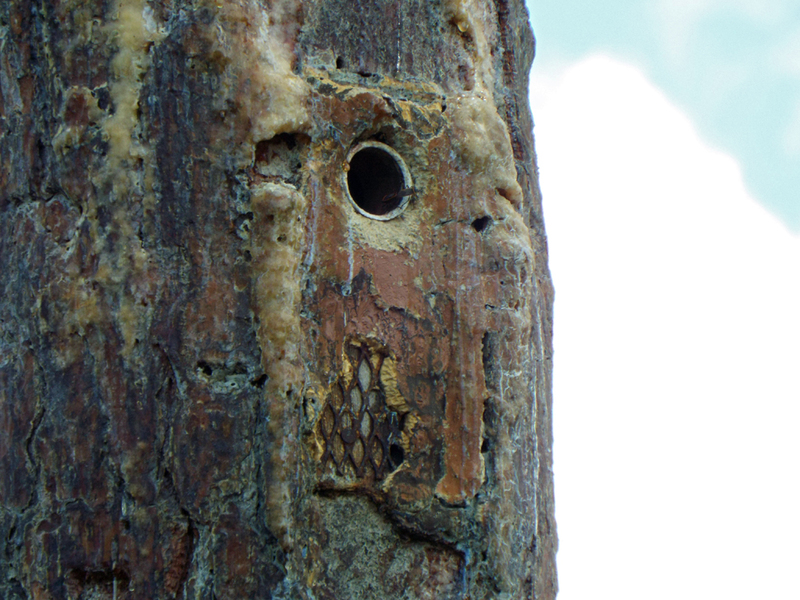 Someone got the idea of cutting into younger pines and embedding a nest box, then sealing it up. And that crazy idea has worked! There are now Red-cockaded Woodpeckers breeding at Three Lakes WMA as well as the Hal Scott Preserve and their numbers have been increasing. They still have a long way to go, and the birds are extensively monitored. Unlike many woodpeckers that use dead trees for nests, Red-cockaded Woodpeckers prefer mature (as in hundreds of years old), living trees with heart rot. The relatively young trees of the pine flatwoods here don’t have heart rot, so this nest box solution was devised. We started at the Prairie Lakes Unit, but the temperature was getting really high and most birds were inactive and sheltering from the Sun. There was a Bald Eagle nest with an adult using it as a large sun shade. This nest has a nice built in rain and sun shelter. 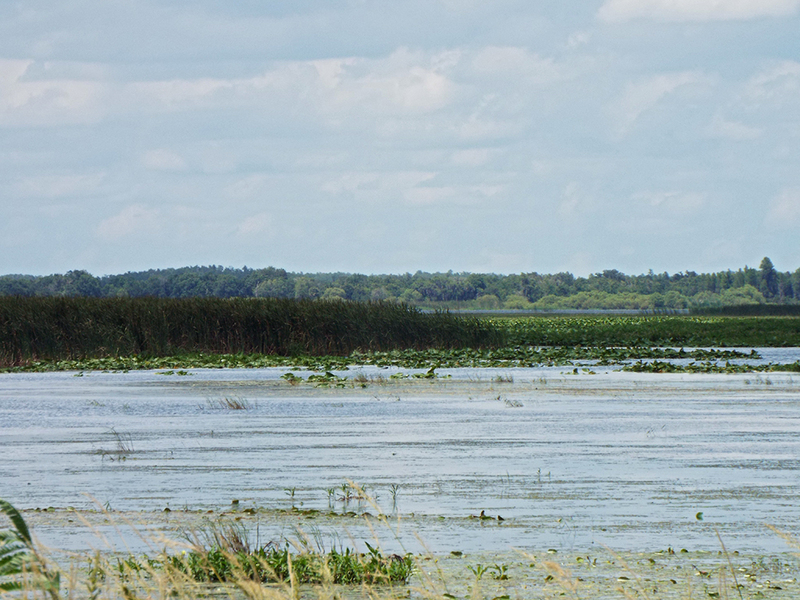 We were making our way to an observation tower at the edge of Lake Jackson, and the habitat looked lovely. It might have been a miscalculation not to split up the goals of this trip into two separate trips. The woodpeckers are best found when they first leave their nests for the day at dawn. Finding them in the vast pine flatwoods during the afternoon would have been by “lucking into” them, as Laura Erickson says. At the gate at the end of the road a solitary Swallow-tailed Kite soared low over the tree tops and was gone in the warm breeze before I could even raise my camera. We did eventually make it to the tower, by way of a half-mile side trail through a hammock habitat near the lake. The signage was confusing at first because it indicated the tower access was through those woods. It turns out that the tower was only a few hundred yards ahead of the hammock trail! Nearer the tower, there were several immature White-eyed Vireos that I got great binocular views of, but they were hopping through some dense branches making photography difficult. Fish Crows buzzed the tower a couple of times, too. There were a few Common Gallinules scattered on the lake below, but I expect there are plenty of waterfowl and wading birds during the winter. Lake Jackson, brimming with potential. I’ll be back this fall and winter. From the Prairie Lakes unit, it’s a short drive over to the Main Unit and the promise of Red-headed Woodpeckers, more Red-cockaded Woodpecker nest trees and whatever else might be there. 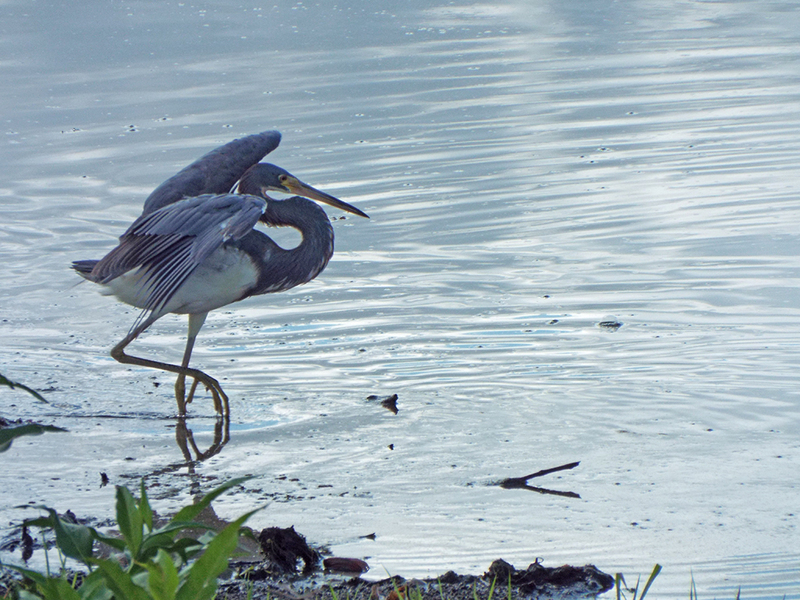 The afternoon was wearing on and as the sun lowered some bird activity began to rise. First, there were some high-pitched calls that sounded like squeak-toys. 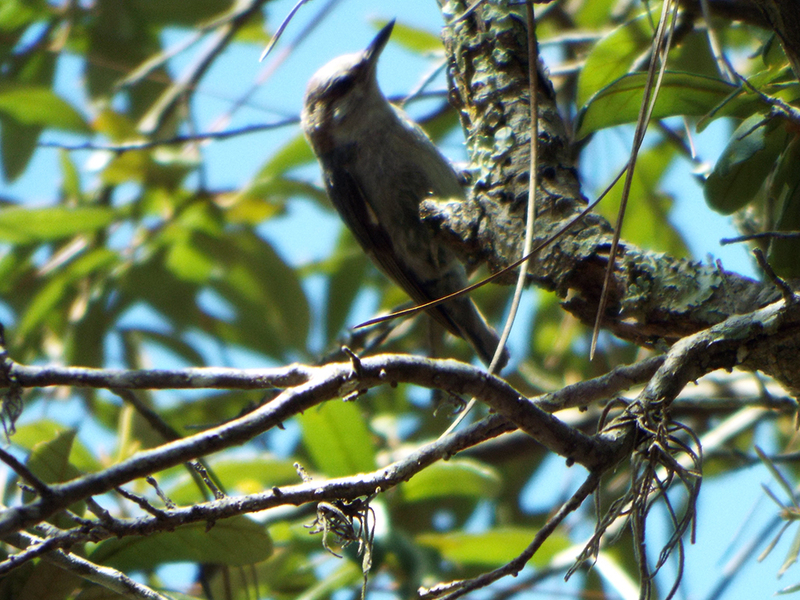 Getting out of the car near some bee hives suddenly a band of Brown-headed Nuthatches flew into the nearby pine branches. 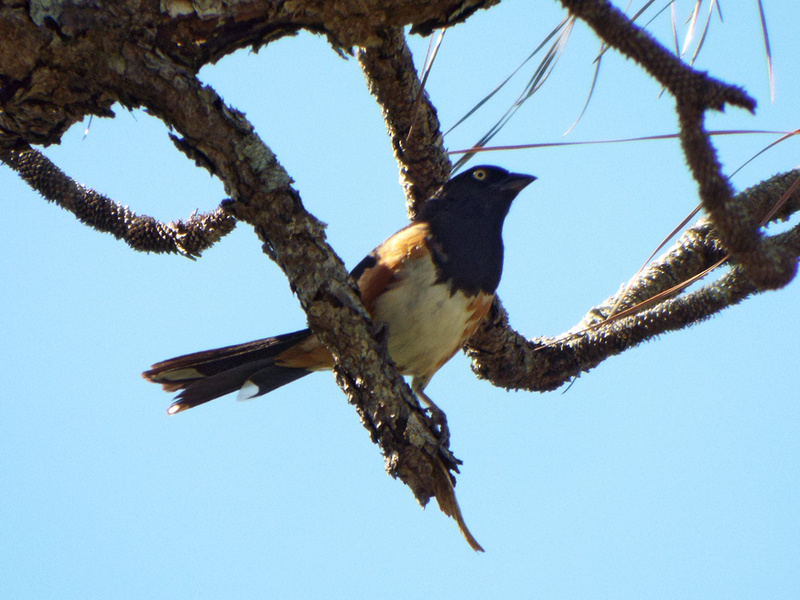 I had been hearing distant Eastern Towhees off and on all day, and finally one flew to a nearby tree, singing and fanning his tail (likely a territorial display). The woods were definitely getting more active as late afternoon approached. Time to come out and play! One the “Road 1” loop there was a flash of black and white, partially backlit, as a bird paralleled the car’s path down the road. It was a Red-headed Woodpecker! Soon another one was making small flights from tree to tree, barely staying in view. I was really excited. When I started birding in Massachusetts, New England was outside of the Red-headed Woodpeckers normally expected range, and I never saw one. When I went to grad school and worked in West Virginia, I never managed to see one. Even all the field trip with the Space Coast Birding and Wildlife Festival came up empty for me. So it was really thrilling to see them and to know where I can go and get some better looks in the future. We came back out toward the main road and stopped to let a Northern Bobwhite and her chicks cross the road in front of us. She got confused, though and led them back where she had come out, the babies running for cover. 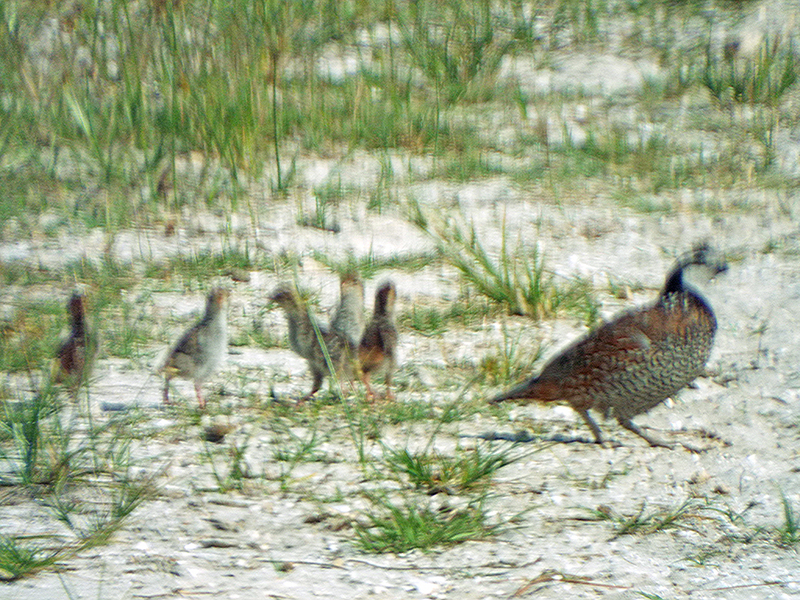 I had to take the photos through the front windscreen, so these aren’t the best quality, but BABY BOBWHITES are cute! I know this photo is pretty atrocious, but look at those little babies! Something about the way they were following their mom reminded me of the beginning of The Partridge Family. After that, there were quite a few Eastern Bluebirds that kept pacing ahead of the car, and a couple of Great Crested Flycatchers. We also passed various raptors coming out for their early evening patrols, including Red-shouldered Hawks and one Cooper’s Hawk. It was a very long day – almost 12 hours of birding and I was really exhausted, but happy. Camille and I both got some life birds and got a good look at some habitat for future adventures. There was one mystery for the day. Some time after seeing the Red-headed Woodpeckers, I heard a high, clear whistle that sounded exactly like a Carolina Chickadee song (“fee-bee bay-bay-bay-bay”). It called out several times, up in the taller pines, but I could not see it, and there were no good paths into the woods to try and track it. I know a lot of birds can sound alike, but this was very distinctive. The only “problem” is that a Carolina Chickadee at Three Lakes in June would be quite rare – even rarer than in Brevard County – but without a sighting, there’s no real way to “officially” say I got the bird. I choose to believe it was a chickadee – others, including well respected birders on the Brdbrain e-mail list say it probably wasn’t. I did get some encouragement from David Sibley (through a comment I left on a page about Titmouse songs on his web page). The bottom line is to get out there again and find that bird! Time will tell.